Kenah has been among the most consistent American distance runners, dating back to her high school days. She comes from an athletic family; her father ran cross country, and her mother was a fast runner as well. She followed her older sister out for the track team as a 9th-grader, and has been running ever since. As a younger sibling, Kenah took pride in the fact that as a youth she surpassed her sister抯 athletic accomplishments卭riginally a 400m runner, she was convinced to go out for cross country by her coaches: 慖 thought they were insane. 3.1 miles was much too far�...had a torn plantar fascia that she suffered in May 2000. The injury was diagnosed following the Oregon Twilight meet, where she posted a personal-best time of 15:10.5. 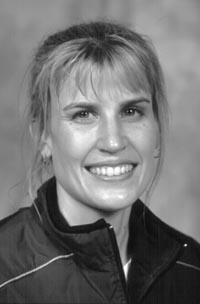 Kenah was still troubled by the injury at the Olympic Trials, where she finished 11th in the first round heat of the 5000m... earned a degree in communications (education minor) at Villanova... married Rich Kenah, bronze medalist in the 800m at the 1997 World Championships, on September 26, 1997... maiden name is Goddard. 2002: 2nd at USA Indoor 3000m (8:58.32)� 5th at USA Outdoors 5000m (15:23.32)� 4th at USA 7-Mile Champs (38:50)� 8th at U.S. 5 km Champs (16:10)� 3rd at adidas Oregon Track Classic 5000m (15:14.69)� on European circuit in Grand Prix action, finished sixth at Zagreb 1500m (4:09.16)卹anked #4 in U.S. at 3,000m, #5 at 5,000m by T&FN� bests of 4:09.16 (1500m), 4:37.55i (mile), 8:54.41 (3000m), 15:14.69 (5000m) and 33:27.68 (10,000m). 2001: 2nd at USA Indoor 3000m (8:55.69)� 6th in semifinal heat at World Indoors (9:02.24)�sup>th in 5000m at USA Outdoors (15:30.42)�sup>rd at U.S. 4k XC (12:50)� 59th at World XC 4K (16.26)...ranked #10 at 1500m, #4 at 3000m & #8 at 5000m in U.S. by T&FN卋ests of 4:11.86, 4:31.10, 8:53.70; 15:30.42, 8:55.69i. 1999: 2nd at USA Indoor 3000m (9:11.82)...2nd in 5,000m at U.S. outdoors (15:26.6)�th at World Outdoor 5000m... bests of 4:09.33, 4:38.68 (mile), 8:42.68, 15:13.42, 33:22.96.